Visual Hosting Review 2019: Is Visual Hosting a Good Hosting? Visual Hosting is not a shared web hosting provider offering beginner-friendly features. It’s a competent Argentinian provider of Cloud VPS plans, dedicated servers, and similar solutions. 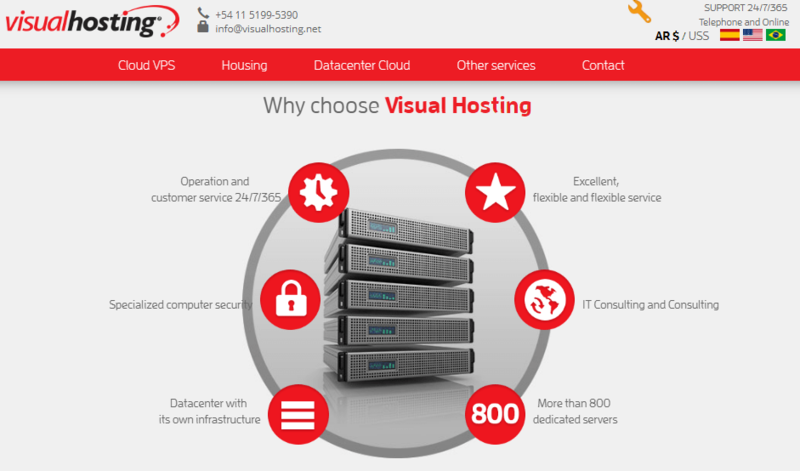 Visual Hosting is an Argentinian company that provides cloud VPS, dedicated servers, and other high-end services including cloud data center services and colocation. Its data center is in Argentina, but its website is available in Portuguese and English as well as its native Spanish. Visual Hosting doesn’t do shared hosting or other low-end hosting services for small businesses to power up their websites. Its target customers are medium-sized e-commerce companies and large organizations. This company’s “starter” service is its Cloud VPS that comes in three flavors. The Standard plan provides 1 GB RAM, 10 GB disk storage, and one public IP whereas the Premium plan provides 4 GB RAM, 100 GB disk storage, two public IPs, and 50 GB backup storage. In the middle sits the Advance plan that adds cPanel and higher resources to the Standard plan. What you won’t get is the kinds of free features such as free SSL or a free registered domain that you often get from low-cost shared hosting providers. But, as already hinted, you do get the cPanel control panel on all but the most basic plan, plus full root access, and you can install any applications you want. I like the redundancy features that duplicate your data in case of system failure, plus protection against third parties as part of the security setup. As your business grows, you can demand more resources from your admin panel without having to give any notice to terminate your current plan. Visual Hosting’s VPS prices are reasonable for the features on offer, and you can save an additional 20% if you’re willing to take an annual plan. It may be worth taking a chance on an annual commitment because this company has the confidence to give you a 30-day money-back guarantee that should get you out if you’re not entirely satisfied within the first few weeks. Visual Hosting provides a knowledge base for self-support, but you have to sign in to use it. Visual Hosting does well when it comes to providing high-end hosting and data center solutions. If that’s what you’re looking for, then this could be the vendor for you. But beware that this is not for small businesses and beginner webmasters who are looking for simple shared hosting with user-friendly features such as a website builder. Get a high-end, low-cost Cloud VPS from Visual Hosting. Wondering how Visual Hosting stacks up against other Web Hosting companies? Enter any other Web Hosting company and we will give you a side-by-side comparison.